To verify if two alleged half-sisters (different mothers) share the same biological father. The reason why they must have different, unrelated mothers is the way the X chromosome is inherited: if two women have one X chromosome in common, it would be impossible to know whether it comes from the father or from the mother's side. 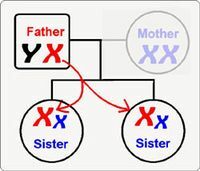 Note: If two alleged sisters with the same biological mother want to know if they share the same father, they will have to send the mother's sample in order to do the X Chromosome Test. Best option for a test between paternal grandmother and granddaughter. If you wish to know if two alleged sisters also have the same mother, or you are not sure if they have different mothers, you will require a Kinship Test. How is the X chromosome inherited? Men have one X chromosome and one Y chromosome, while women have two X chromosomes (and no Y chromosome). Men inherit their X chromosome from their mother. Women inherit one from the father and one from the mother. Therefore, the X Chromosome Test can be useful to verify different relationships, on both the paternal and the maternal side.